Los Angeles, long associated with red carpet glitz and glamour, has voted to ban the sale of fur products, making it the largest American city to respond to a unanimous City Council vote to draft an ordinance that will ultimately prohibit the manufacture and sale of new fur products within the city. 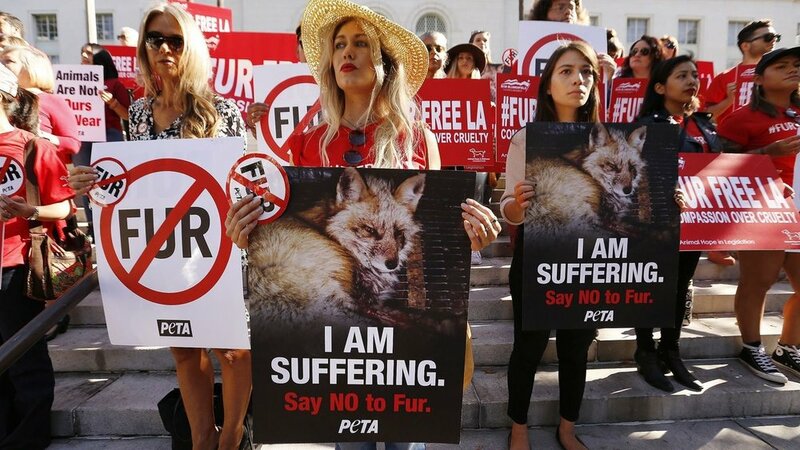 Projected to take two years to institute, the first step is to draft a city ordinance that takes into consideration “how fur apparel is utilized by religious organizations, and possible exemptions, as well as potential conflicts with federal and state laws relating to sale of fur products derived from legally trapped animals,” writes The LA Times. West Hollywood already has a fur ban, but the law was changed to exempt fur from animals legally trapped under state law. Berkeley and San Francisco have fur bans, adapted to comply with local laws and ordinances. Keith Kaplan, spokesman for the Fur Information Council of America, a trade group for manufacturers and fur merchants, argued that global retail fur sales are $35.8 billion and that more than 1 million people were employed, as of 2014. Big industry brands abandoning fur in their collections include Michael Kors, Armani, Gucci and most recently Burberry. The current London Fashion Week promoted itself as being fur free. Is Meghan Markle's No Fur Stance Influencing Burberry Talks On Pledging A No Fur Policy?